All of the featured providers of Veterans Funeral Care are trusted members of our network that are known for their quality care and attention to detail. Each of these locations have received specific staff training to assist you with all aspects of the funeral and cremation process for your Veteran. Indiana Funeral Care & Crematory is one such provider. This family owned and operated funeral home offers compassion and flexibility, along with caring service, to best meet the needs of the families they serve. Whether you prefer a more traditional church-based service or desire a National Cemetery burial, the staff at either Indianapolis location have the skills and training to assist you and your family in making all of the important and often overwhelming decisions. They know that making funeral arrangements is not a pleasant experience, so allow the staff of Indiana Funeral Care to take care of all the details as your trusted guide through the funeral planning process. Indiana Funeral Care & Crematory is grateful for all of our Military Veterans and their families, for their unwavering commitment to our country. The staff at Indiana Funeral Care is dedicated to expressing their gratitude for veterans’ unselfish service to our country through compassionate and friendly funeral service planning. 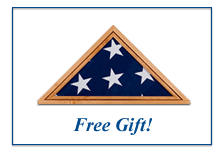 Their staff members are certified through Veterans Funeral Care to offer special value services and to help you take advantage of Veteran’s National Cemetery benefits, Social Security benefits, as well as full Military burial benefits for all Veterans and eligible family members. As a featured provider of VFC, Sara Thompson and her staff will assist you and your family in preparing a customized and memorable service for your Veteran while also giving you piece of mind with the completion assistance of necessary benefits paperwork. Years of commitment to making funeral care affordable and personal have lead Indiana Funeral Care & Crematory to the top of the preferred funeral service provider list in the Indianapolis area.